Skateboarding can be divided into two basic approaches. On the one hand there is park skating: athletes use optimized structures that are especially made for skateboarding on dedicated locations. On the other hand there is street skating: it’s philosophy is to use the „natural“ topography of a city and to interpret urban structures with an individual approach. Skaters get lost in the concrete jungle and cruise from one spot to the other all day long. 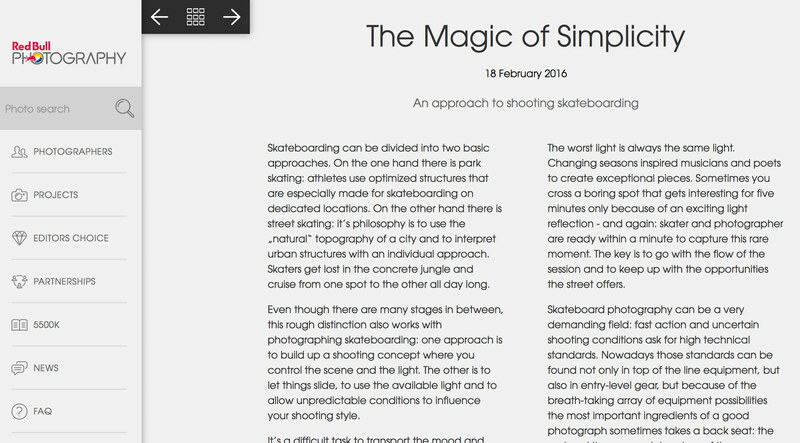 Even though there are many stages in between, this rough distinction also works with photographing skateboarding: one approach is to build up a shooting concept where you control the scene and the light. The other is to let things slide, to use the available light and to allow unpredictable conditions to influence your shooting style. It’s a difficult task to transport the mood and rawness of the streets to a public of non skaters. But photography is a very endearing media that facilitates that to a broader audience – the possibilities and the variations are endless. There is an authentic match between the lifestyle of street skating and the adaptive shooting style that developed a hundred years ago. The magic happens when the camera captures part of the skate life and brings the beholder of the final image closer to a vibrant urban experience. The worst light is always the same light. Changing seasons inspired musicians and poets to create exceptional pieces. Sometimes you cross a boring spot that gets interesting for five minutes only because of an exciting light reflection - and again: skater and photographer are ready within a minute to capture this rare moment. The key is to go with the flow of the session and to keep up with the opportunities the street offers. So really, what more do we need to tell exciting stories in the history of urban life, and to be able to freeze those now-or-never-situations. A small camera body, our favorite prime lens, a skateboard, a good session and some soul. What more?